My opinion is not biased, as I, too, am a regular consumer of energy drinks! I decided to take this project on in school, and I just decided I’d share some of what I learned with you guys. Natural energy mainly comes from carbohydrates, and proteins. Carbohydrates are sugars, and often come in the form of glucose (in the body), galactose (less sweet, from milk), fructose (the most sweet, in fruit), etc. 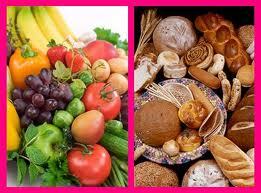 By eating plenty of fruits, and vegetables, as well as breads, and cereals, one can expect an increase in energy. Eating foods that are rich in sucrose (found in soda), however, can result in major energy crashes later, so be sure to read the packages before you consume products! 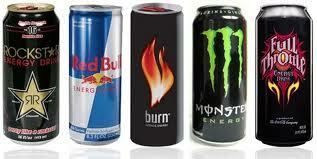 Many energy drinks claim to be natural health products. They say this because they contain ingredients such as guarana seed, taurine, ephedrine and ginseng. Guarana seed works much the same way as caffeine in coffee beans, except it is much more potent (3-4% vs 1-2%). Because of this, Guarana seeds can cause heart palpitations in people with even mild heart conditions. The body produces taurine in our muscles and central nervous system, but can also be found in fish, meat, eggs, and milk. Taurine is one of the main ingredients of the typical energy drink (think Monster Full Throttle, Rockstar, etc. ), and it is a potent anti-oxidant, as well as lowering cholesterol and blood pressure levels. Despite the many “natural health products” available in these sweet drinks, do not be fooled. Energy drinks also contain massive amounts of caffeine, and mounds of sugar, which result in hard crashes, and spikes in blood sugar level. Although research doesn’t yield too many side-effects of energy drink consumption, the main side-effects are heart problems, and worsening of bipolar disorder, and other such illnesses which could trigger the jitters, paranoia, etc. Energy drinks are a quick and tasty way to gain energy, but one should consult their physician before seriously consuming them. Sign up to receive instant notifications for each new blog I post!